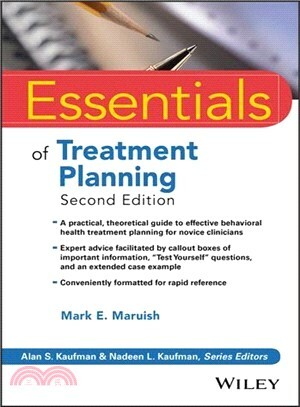 Essentials of Treatment Planning, Second Edition is an updated and easy-to-use guide to the development and use of treatment plans for behavioral health care patients. The book incorporates current research and developments in treatment planning that have occurred since the publication of the first edition. Designed as a nuts-and-bolts guide, the book covers essential material such as the role and benefits of treatment planning in a clinical setting, approaches for conducting comprehensive patient assessments, the use of assessment information to develop individual treatment plans, and strategies for ongoing evaluations and revisions of treatment plans. Essentials of Treatment Planning, Second Edition explores how to develop and use treatment plans to strengthen the entire treatment process. An important component in documentation, accurate treatment plans provide myriad benefits, including: meeting the accountability criteria of insurers and behavioral health care organizations, enhancing efficient coordination of care with other health care professionals, and facilitating better communication with outside reviewers. In addition, behavioral health professionals—psychologists, psychiatrists, clinical social workers, mental health and substance use counselors, and others—may gain the added security of protection from certain types of litigation. As part of the Essentials of Mental Health Practice series, the second edition of Essentials of Treatment Planning contains the information busy behavioral health professionals need to practice knowledgeably, efficiently, and ethically in today's behavioral health care environment. Each chapter features numerous callout boxes highlighting key concepts, bulleted points, and extensive illustrative material, as well as "Test Yourself" questions that help gauge and reinforce your grasp of the information covered.